Rosalie School welcomes visitors from the community and the field of early childhood education. With our belief that children are citizens of today with voices and rights in democratic society comes the responsibility to empower the children to have their voices heard in the larger community. We are particularly inspired by the ways in which very young children from the municipal infant-toddler centers and preprimary schools of Reggio Emilia, Italy have been empowered to influence the way people all over the world see the image of the child and what it means to do school with young children. One particular example is shared in The Diary of Laura: Perspectives on a Reggio Emilia Diary by Edwards and Rinaldi. It has been almost 30 years since Laura's teachers documented the story of Laura and the Watch, a story which has been shared again and again throughout the world. Decades later, 10-month-old Laura continues to change the way educators think about children and schooling for the very young. We welcome the opportunity to empower the voices of the children of Rosalie School to influence what you believe about the image of the young child and what it means to do school with young children through documentation shared in the community at conferences and in journals, through school visits, and through the placement of student teachers in our program. Community members and early childhood professionals may contact the school to arrange a visit. 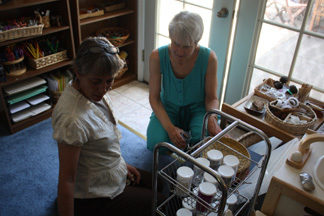 Our teacher will work with you to determine what type of visit is most appropriate to your interests. Since we are a very small school, large groups are best accomodated when children are not present. This is a great time to really explore the beauty of the environment and the complexity of the intelligent materials available to the children. It also allows visitors the time to properly examine and discuss the accumulated documentation, and ask questions of the teacher. Smaller groups and individuals may visit while the children are present to experience the interactions and flow of learning. Please ask lots of challenging questions during your visit. What we do at Rosalie School is not nearly as important as why we do what we do, and how we think about what we are doing before, during and afterwards. 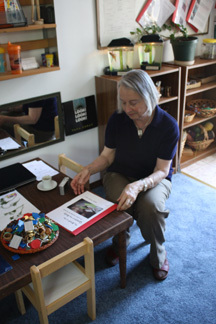 We had the honor of a visit from Lella Gandini, the United States liason for the dissemination of the Reggio Emilia approach, in June 2010. She had only good things to say about our very newly opened school, and was particularly interested in the documentation book authored by six-year-old Eleanor and created at Rosalie entitled The Brain is the Queen of the Body. She asked to take a copy of the book back to Reggio Emilia to share with the educators there how Rosalie School employed the understanding of a six-year-old on school, learning and the brain to begin the project of what it means to do school with young children.